Like most people, as fall approaches I start yearning for savoury meals that warm the bones. I start craving apples and cinnamon, richer textures, and more complex layers of flavours. This is a recipe that my husband Justin has been working on for a few years now, and we hope you love it as much as we do! Cooking it will make your house smell wonderful in the morning – like apple pie – as the anise and cinnamon and fried apples waft through the house it can be delightfully appetizing. Luckily, this recipe makes two very hearty portions. This is a breakfast treat that is flavourful, but is still very healthy, with its high fibre and low sugar content. It can easily be tailored for more or less decadence, depending on the toppings you use. As with all recipes, success depends greatly on good quality ingredients – I urge you not to take the easy way out with the popular version of “cinnamon”, generic vanilla extract, or “whipped cream” that is not actual cream (you’ll see why below). 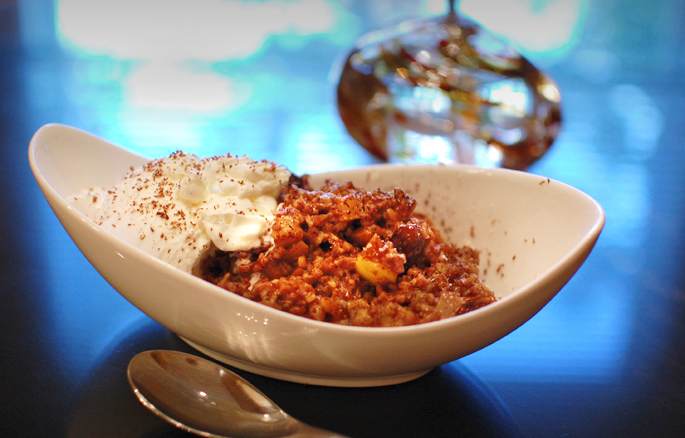 Chai spiced oatmeal with the decadent lusciousness of real whipped cream, and nutmeg shaved overtop. Bring the steel-cut oats and water to a boil in the saucepan and then reduce to low heat. Split the cardamom pods open with your finger, and discard the external husks. Make sure any seeds you use are whole and dark (not withered or reduced to dust). Once you have enough seed fragments to fill ¼ teaspoon, put in the mortar. Add the star anise to the cardamom in the mortar and grind to a fine powder. Set aside in a small dish. Add the ¼ teaspoon of Saigon cinnamon to the dish. Star anise on the left, and cardamon seeds (removed from the pods) on the right. Crumble the stick of Ceylon cinnamon into the spice grinder and grind to a fine powder. Add this to your spice mix in the small dish. Cassia on the left, Ceylon cinnamon on the right. Cinnamon crumbles, and is more subtle and delicate. Why use Saigon and Ceylon cinnamon specifically? Saigon cinnamon is hotter and more powerful (it’s actually made from a potent variety of cassia). 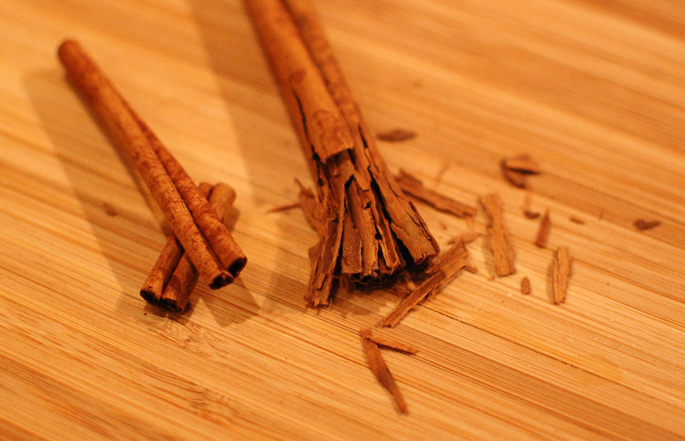 In most grocery stores, the powder and sticks generally sold as “cinnamon” are actually made from low-grade cassia. Cut the ends from the two vanilla bean pods. Slit the pods lengthwise, then lay down flat and scrape out the paste (actually made of tiny seeds) with the knife tip. Use a smooth, continuous motion from one end of the pod to the other. Be very careful! Set the paste aside. Carefully slit the vanilla bean, then scrape out the paste. 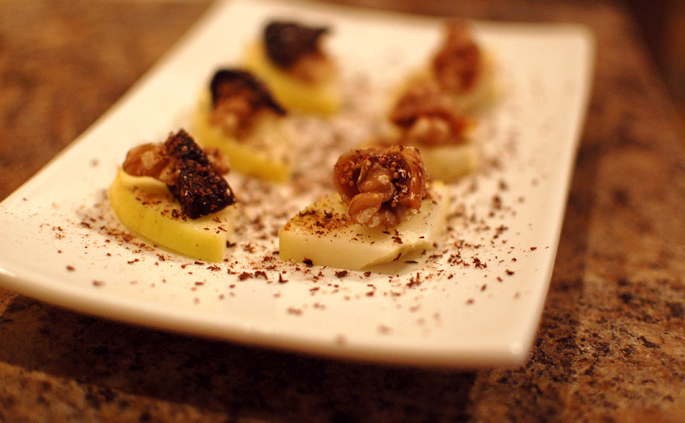 Remove the stems from all of the dried figs, cut into small pieces and set aside in a dish. We like to cut the figs into pie-pieces/triangles. Reserve 6 pieces. Set the heat under the frying pan to medium-low and add the two teaspoons of canola oil. Dice ½ of the apple, add to the pan and gently sauté, ensuring they brown slowly and don’t burn. Set aside ¼ of the apple for later. While the oats and apples are cooking, you can enjoy a nice hors d’oeuvre! Slice the remaining apple quarter into six pieces, and lay on a small plate. Top with a piece of walnut wrapped in one of the reserved fig pieces. Sprinkle Saigon cinnamon, then shave a bit of unsweetened chocolate and nutmeg over top. This will help you withstand the torture of the tantalizing aromas until the oatmeal is ready! Keep an eye on the oats, stirring occasionally to make sure nothing sticks to the bottom. You may need to add a little splash of water from time to time to help. Add the vanilla bean paste to the oats cooking away in the saucepan for the last 5 – 10 minutes of cooking time. When the apple pieces are nice and golden (and the oats are cooked with no water remaining), dice and add the last quarter of the apple (these pieces will be a bit crisper for some textural variety), and most of the figs into the frying pan. Add the spice mixture, and ensure all the apple pieces are nicely coated. Let this cook for a final few minutes and then, deglaze with ¼ cup of water, stirring thoroughly. On the left: the oatmeal with unsweetened chocolate shaving added. At right: the apple, fig and spice mixture. Add everything from the frying pan into the saucepan full of oats, and stir thoroughly. Add the chopped walnuts as well. Grate about ½ – 1 teaspoons of unsweetened chocolate into the oatmeal, and gently stir in. This is why you use unsweetened chocolate, and not too much of it: it adds a nice rich bottom note to the dish, but does not taste overtly chocolatey. If there’s too much cocoa and sugar, you just end up with a chocolate kid’s cereal nightmare. We enjoy adding the whipping cream – so rich! If you go for this, beat the whipping cream and spoon over top. Shave nutmeg to taste (I like lots). If you desire a sweeter version of the dish like Justin does, drizzle a small amount of maple syrup over top. Justin invented this dish to be a savoury, sugar-free breakfast that I could enjoy. If you want a slightly sweeter version, try using dates instead of figs. You can also try substituting pecans for the walnuts. Give it a try – it turns a chilly morning into absolute heaven!